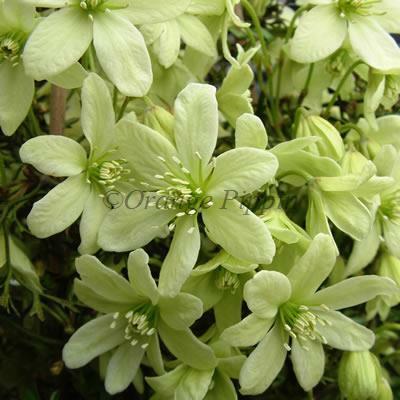 An evergreen, non-clinging Clematis which covers itself with small, fragrant, lime-green flowers and lemon centres, that are primrose-yellow in bud during the spring. Clematis 'Pixie' is a slow growing plant with finely cut, dark green leaves which are bronze coloured in spring and is a dwarf growing variety, making it ideal for the smaller garden, where it can be used as ground cover within the flower border, trained as a climber or planted in a container on the patio. 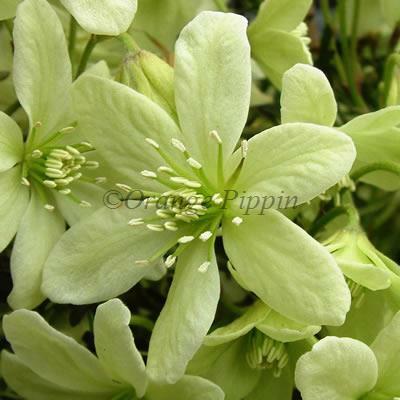 Clematis 'Pixie' was raised by Graham Hutchins of County Park Nursery, Essex, England.